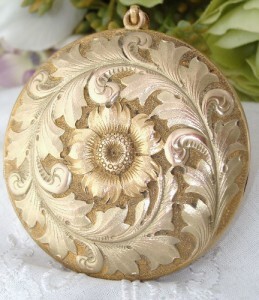 This Antique locket is simply of Awesome design & styling - it is simply stunning! It features a fabulous chased design combining the Yellow Gold hued body and central Sunflower with Green Gold hued foliate elements. The combination of smooth, shiny and textured finishes and the intricacy of the design is simply stunning and catches the light at every turn! The pictures really do provide the best description of all. The back is plain and void of a monogram which is very rare for a locket from its era. Inside are both original frames and it is suspended from the original thick ribbed bail ready for a chain to be added. It has the silky smooth feel usually only associated with solid carat gold and expected of quality antique/vintage jewellery. Weight: a very hefty 31.5 grams! Near MINT condition! There is no damage, repairs, dents or wear and I am hope the pictures show just how impressive this really is. The combination of the green and yellow gold hues is amazing and not a combination commonly seen. For a locket its age it is just fabulous and just perfect for gift giving – I doubt it has even been used and has been kept tucked away safely! The chain is NOT included however suitable chains are available for purchase.